"Come along—I know you'll enjoy the ride to FatLand!" Alvin and Reevie thought that by living in FatLand they could give their children and each other a chance for a life free of sizeism and racism. They didn't count on their lovely twin daughters' curiosity and yearning for excitement and danger. Joanne and Ed carved out what they thought was a peaceful existence. But their bright children are anything but happy in the well-appointed home and tranquil life their parents had created in FatLand. "FatLand is fun to read: it's a great adventure and it incorporates and combines the charms of mysteries, "soft" science fiction, thrillers, and erotica. I recommend it to anyone and everyone with enthusiasm. [It] belongs to the wonderful tradition of utopian/distopian novels and short stories that goes all the way back to the nineteenth century...and farther....This literary tradition is rich, entertaining, and enlightening. I'm thrilled we now have a pioneering practitioner of that tradition dealing with bigotry aimed at and the oppression of fat people. This fantasy explores the false science behind that prejudice and discrimination and the various ways the prejudice encouraged by that false science can be countered and a better world achieved. It is an enthralling page-turner. Zellman explores so many kinds of conflict—those between people and their own natural bodies, those between one kind of natural body (slender) with another kind of natural body (fat), those between generations, those between business competitors, those between conflicting and contrasting political structures, and more. And don't forget to take the time to read the wonderful meal descriptions!" 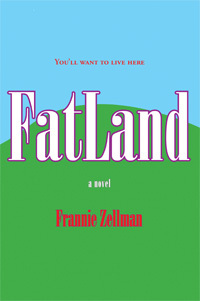 "Frannie Zellman has woven an intriguing tale of a territory named FatLand, where fat people can live without being harassed. In fact, it's against the law for weight to be mentioned. People of FatLand have raised their children in a society completely free of any kind of fat prejudice. where people are going to jail for breaking the Pro-Health Laws."